Nickel Sulfide Ores and Impact Melts: Origin of the Sudbury Igneous Complex presents a current state of understanding on the geology and ore deposits of the Sudbury Igneous Complex in Ontario, Canada. As the first complete reference on the subject, this book explores the linkage between the processes of meteorite impact, melt sheet formation, differentiation, sulfide immiscibility and metal collection, and the localization of ores by magmatic and post-magmatic processes. The discovery of new ore deposits requires industry and government scientists and academic scholars to have access to the latest understanding of ore formation process models that link to the mineralization of their host rocks. The ore deposits at Sudbury are one of the world’s largest ore systems, representing a classic case study that brings together very diverse datasets and ways of thinking. This book is designed to emphasize concepts that can be applied across a broad range of ore deposit types beyond Sudbury and nickel deposit geology. It is an essential resource for exploration geologists, university researchers, and government scientists, and can be used in rock and mineral analysis, remote sensing, and geophysical applications. Dr. Peter Lightfoot is a Chief Geologist with the Brownfield Exploration group at Vale Base Metals. He is responsible for technical aspects of the exploration programs at Sudbury, Thompson, and Voisey’s Bay and tracks the developments in understanding of the geology and global supply of metals from nickel sulfide and laterite deposits. He received his B.A. from Oxford University in 1980, his M.Sc. degree from the University of Toronto in 1982, and his Ph.D. from the Open University in 1985. Following post-doctoral studies at the University of Toronto, he joined the Ontario Geological Survey in 1987, and worked extensively on Sudbury and undertook a joint program of research on the Noril’sk Deposits. In 1996, Peter joined Inco as Senior Geologist and worked on Inco’s Voisey’s Bay Project and international project generation. With Vale’s acquisition of Inco in 2006, his responsibility continued to focus on global nickel project generation. In 2010, Peter returned to provide technical support in exploration within Vale’s mining camps in Canada. Peter is an Adjunct Professor at Laurentian University and Associate Editor of Elsevier’s Ore Geology Reviews. For 25 years, Peter has been based in Sudbury, and through his linkages to industry, government and academia has been positioned to develop and assemble the ideas presented in this book. 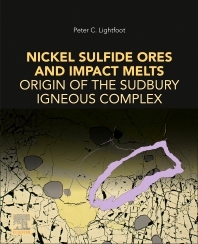 "The publication of Nickel Sulphide Ores and Impact Melts marks the first time that a century of industry and academic learning have been integrated to provide a comprehensive model of the formation of the Sudbury Structure and its ores." "Within the pages of this book lies all the information needed for a modern understanding of the geology, petrology, geochemistry and metallogeny of the Sudbury basin, establishing it as an indispensable resource for students, academics and industry professionals with interests in magmatic ore deposits." "The importance of the book cannot be overstated; it establishes a new level of understanding of the Sudbury Structure that will underpin the next generation of research and discovery." I am thoroughly impressed by this book. An excellent resource to understand the geology comprising the nickel sulfide deposits in the Sudbury basin. A must read for anyone interested in sulfide deposit geology. Comprehensive review by a former Vale exploration/research geologist. that includes a quite a lot of unpublished data. Figures are not very sharp, but well designed. Very well written.